Turou Retreat is a wonderful family home in Titikaveka with a 5 min walk to the Tikioki Beach which is one of the best snorkelling beaches on the Island, opposite the Fruits of Rarotonga cafe. The house is within easy walking distance to Muri Beach and there you have top restaurants, bars, car/bike rental facilities, markets,food shops and internet available, along with Kayak hire and lagoon cruises departing daily. This very spacious 3 bedroom home has a large main bathroom and the master bedroom with its own ensuite and walk in wardrobe. Turou Retreat is open plan living with a large kitchen, and large dining and lounge area. A huge deck spreads across the width of the house where you can enjoy BBQs or just relax and chill with a refreshing drink or two. 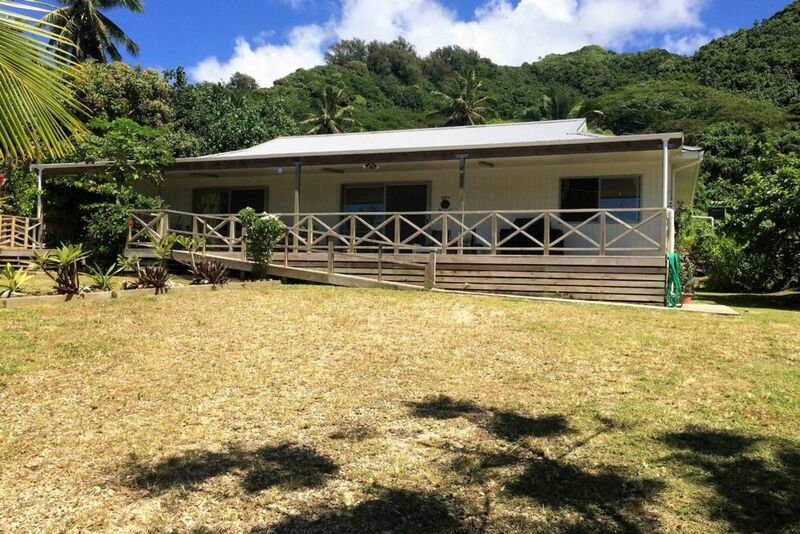 So relax on the deck and enjoy the peacefulness with the beautiful sound of the roar of the sea in the distance or spend the day at the beach or travel around Rarotonga to view the many sights and things to do on the island. We ask that if anything is broken or damaged during your stay you will be liable to pay the full cost to either repair, replace, or pay. This was our second stay at Turou Retreat. Perfect for families or large groups. The house is only about 5 years old, nicely presented, and reasonably priced. Suited us as there is a gas hob for cooking and a microwave, and the kitchen is well stocked with pots, utensils etc. Plenty of DVDs to watch on rainy days. Short walk to the beach, great snorkeling straight across the main road. Plenty of hire shops and food options at Muri up the road. Spacious house with all amenities. Walking distance to the beach and bar (Charlie’s). Short driving distance to Muri. Huge deck was great and the shade it offered was appreciated!